• How many jobs will it add? • Where will they live, considering the region is in the midst of a housing shortage? • How will they get to and from work? Traffic is already congested in the area. To answer the first question, the city will probably apply a ratio of square feet per employee to the total of 1.75-million square feet of office space. Senior City Planner Kyle Perata said the planning department is still reviewing Facebook’s proposal and will decide later what ratio to use. At one time, it was a rule of thumb that a company needed 250 square feet per employee. That’s when companies were fond of having employees work in a cubicle. Today, tech companies have dropped the cubicles for benches, where workers sit shoulder to shoulder. Today, the ratio for tech companies is 150 square feet per employee. Using that ratio, the village would have 11,666 employees. Facebook declined to say how many employees it would put in the village. However, the company’s current expansion on Constitution Drive will provide office space for 6,550 new employees once completed. The city budget says that Facebook — the city’s largest employer by far — has a total of 9,350 employees. They work in two areas, the old SunMicrosystems campus on the Bayfront Expressway and the Frank Gehry-designed building at Bayfront and Willow that opened last year. Another question is where will the employees live? The 1,500 homes in the Village project were promised during the approval project of the Constitution Drive development. No additional homes were proposed for the 1.75 million square foot office expansion. Of the 1,500 homes in the Village, 225 will be for low-income renters, a requirement of city approval of the Constitution Drive project. According to the Village project description, 400 of the homes are slated to be built by 2021, then the first phase of the office development will be completed. The other 1,100 homes will be built during the company’s “phase two” of construction, which could be built at least three years after the first phase is completed, according to the project description. Will council push for housing? According to city planner Perata, it’s up to council members to ask for more housing, if they wish to do so. He said the planning process is still in its early stages, and no council meetings about the Village project have been held. Former council candidate Cecilia Taylor said Facebook is adding to the city’s housing problem, but is wary of adding more housing to the east side of Highway 101 due to the congestion that already exists there. Taylor and Johnck are also concerned that the Village will only make traffic worse. 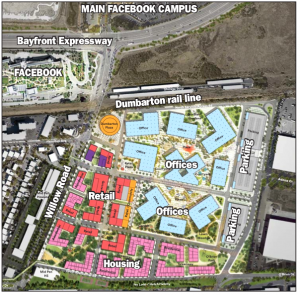 In the social media company’s announcement of the project on Friday, it mentioned that use of the abandoned Dumbarton rail line might be a solution. The Dumbarton, which stopped running in 1982, extended from the East Bay, across the Bay on a rail bridge parallel to the existing highway bridge, and then along the Bayfront Expressway. From there, it cuts through several neighborhoods until it connects with the Caltrain tracks in Redwood City. Restarting the Dumbarton line would require the rehabilitation or reconstruction of the bridge. One study, in 1999, put the cost of the necessary improvements at $130 million. With inflation, that would cost about $190 million today. 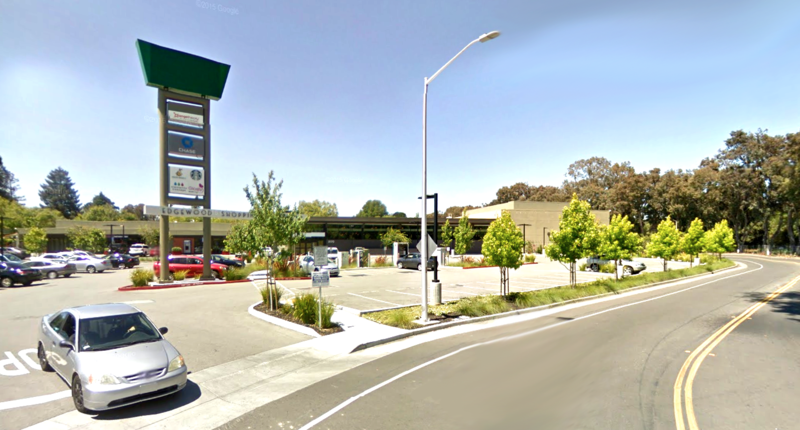 “This would get Facebook employees out of their cars and out of the Belle Haven neighborhood. The council should make the rebuilding of the old Dumbarton Bridge rail project a requirement (for the project,” Taylor said. Johnck also expressed interest in the Dumbarton rail corridor, saying it would relieve neighborhoods that experience a lot of cut through traffic. However, Facebook doesn’t lay out any plans in the Village proposal for revamping the abandoned rail line, but does include a plaza for when the corridor is completed. Facebook previously committed to funding a series of transportation studies, including a $1 million study on the abandoned rail line. Facebook said if a project proposal comes out of the study, it would contribute $1 million toward the project. The Village proposal is currently being reviewed by city planners and it is unknown when there may be any meetings regarding the project.